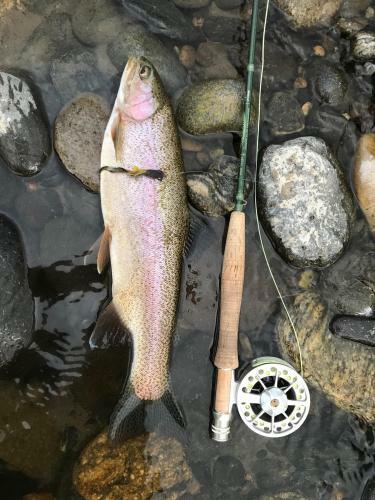 I've been out here at our place in Montana for a few weeks now, but haven't had much time to fish. The days that I had some time were usually very windy, and not worth trying it. I did a couple of floats on the Yellowstone that were mediocre fishing, and finally was able to wade the channel next to the house once and caught a few, including a nice 17 inch rainbow. The river blew out the whole upper half of our island during the spring high water, and now more water is going down our channel next to the house than what was the main channel on the other side of the island. But what it left on the upper end of the island was a very long bar with very shallow water running over it, and one narrow, deeper chute at the upper end. So there is one strong chute crashing into the little rock cliff next to our lawn, a small rocky island, then a very wide riffle dropping sharply off into a deep, fast run along the rest of the rock cliff before widening out and slowing a bit. Even though our channel is carrying a bit more water than the far channel, it's become very difficult for the floaters to run. The very wide riffle is too shallow, and the narrow, deeper chute violently crashes into the cliff with very little room to maneuver away from the rock. The far channel is actually easier to run, but most people floating seem to think they have to take our channel. So they go bumping and sometimes dragging over the rocks of the wide riffle. That was what happened when I caught the 17 incher mentioned above. I was right at the downstream, right end of the shallow riffle when a guide and two clients in a driftboat came scraping over the rocks, dropping into the run right where I was drifting nymphs. I was a bit disgruntled...until I hooked that big rainbow almost directly under the boat! They watched me play it in and net it, and I thought that was pretty sweet. So I was watching the weather forecast for this week, and it looked so good. Yesterday was supposed to be warm, upper 70s, sunny, and not much wind. And then today was supposed to be cloudy but warm, in the low 70s. The weather will deteriorate the rest of the week, and by next week the highs will be in the low 40s and rain and snow is called for. So I was really planning on fishing yesterday and today. Until I got a horrific cold, nose running like a sugar tree, coughing like crazy, a bit of fever, the whole works. Yesterday I was miserable, so needless to say I didn't go fishing. Today was only slightly better. I messed around cleaning up the garage between rest periods. I walked out of the house at 6 PM. Cloudy, 70 degrees, no wind. Walked over to look at the river. Saw a trout rising. 45 minutes until dusk. I came back to the house and told Mary I was going to fish for 45 minutes. She said, yeah, you can fish, or you can rest and get well quicker. But this is the last warm day, I told her, and I had to try it for just a bit. I waded across the upper end of the narrow chute. No other fish rising. Already fairly low light. I decided to toss a streamer, one of my rabbit fur concoctions, on the 5 weight rod. Fished it across the riffle, letting it swing in the current. Halfway across the shallow riffle, I hooked a heavy fish. It shot out into the strongest current and took me nearly to the backing. I waded the rest of the way across the riffle to get the fish into the slack water on the downstream end. Fought it for quite a while before finally netting it. Slightly under 20 inches. I made a few more casts, got one more bump, and then it was getting dark. One good fish in a half hour of fishing. I was happy. Hope you feel better and glad you were still able to get out there and get than one. On your rod is a 20" mark,correct?? If so that fish looks to be more than 20". Not that it matters much, but just curious if that is the case. Nice fish!! Great story as usual.